Up North to Caxton today, despite the weather forecast. On the bike; I tried something slightly new today. Instead of using the batteries in pairs, one pair at a time, I hooked up three pair in parallel, which should give me three tmimes the range. And it did; that worked well. Round about 2pm, I was freezing cold and very wet; it was sleeting. Sleet is a mixture of rain and snow, and so you can see how cold it is. I was thinking seriously about making a run for the car, and abandoning the remaining 20-odd caches in the circuit. I could barely feel my hands. But then the sleet eased up, so I carried on. 69 caches and one DNF, but the DNF had a redeeming feature. This is John, he was leaving the churchyard as I came in. He asked me what I was doing, so I told him I was hunting for a trig point. 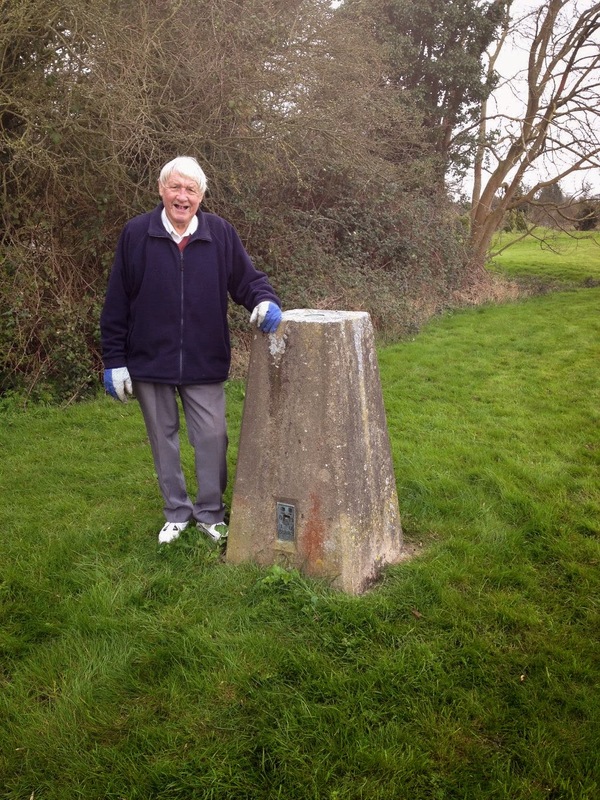 But he didn't know what a trig point was, so I invited him to come and see one, and then he posed next to it. I had a very interesting chat with him, he's lived locally all his life. But he didn't know where the cache was, and I couldn't find it. Another problem; the on-bike voltmeter started showing me a voltage that was a third of the true value. Oh well, I was planning to replace it anyway with the new volts-and-amps meter. The bike worked well; the removal of the iffy connector seems to have fixed the problem I was having. I've moved on a lot since I wrote that five months ago. I'll do an update on it some time. Pretty much all the motors you see, are Chinese, I think. Importing from China is a distinct option, but you can expect to wait weeks for it to arrive. Making your own battery pack is easy if you use Hobbyking Lipos, but read the warnings about them. Aha .... I missed that blog page somehow! Absolutely perfect. I was particularly wondering about chargers. My front wheel conversion kit arrived this morning as it happens (20 inch for a folding bike). It is direct drive but it was 'very' cheap and will serve as a good learning exercise before I convert a spare mountain bike which I hope to have geared and a bit more powerful. Am checking out the Hobbyking Lipos as well. Have you had any 'legality' issues or are you pretty much offroad? The legal status looks a tad grey. Really enjoy your blog when I have time to catch up! May even try Geocaching one day when I have worked out what you have to do ;-) A friend of mine apparently indulges - I will tag along with him one day. BTW My bike is intended for taking aboard a boat and using it at ports on arrival to expand my range a bit. Many thanks for your input Dr S. PS - I still have memories of installing hundreds of copies of your AV software (plus updates) in the the 90s. Your business was always a pleasure to deal with. The legal situation is indeed grey. My understanding is that as long as the motor is "rated at 250 watts or less", then an electric bike is, legally, a bike. As you point out, I'm mostly offroad, on bridleways and suchlike. But I doubt if the police are much interested in an aging cyclist who isn't behaving like a lunatic. If you use Lipos, then you *must* use a Lipo charger, and you should read up on the care and precautions in using Lipos. If you're doing a front wheel, and if the forks are aluminium, you should get a torque arm. If they're steel, and your motor is only 250 watts, you're probably OK without a torque arm (but I'd fit one anyway, the thought of the front wheel escaping from the fork while doing 15 mph on tarmac, is a very ugly thought). I'm glad we were good to deal with - I always had a lot of time for the people at the sharp end who had to sort out the users. Take pictures of your conversion; you can post them for other people's edification.